Protank offers polyethylene and polypropylene plastic tanks ranging from 1 gallon to 20,000 gallons in a variety of sizes and dimensions. Specific gravity ratings from 1.0 to 2.0 are available for water and chemical storage. Higher specific gravity ratings are applicable for a wide selection of chemical applications. Polyethylene storage tanks are rotationally molded from high density linear polyethylene (HDPE) or high density cross linked polyethylene (XLPE). Rotationally molded plastic tanks have increased structural integrity and durability against impact, puncture, or tears. They are also resistant to rust and corrosion. Protank provides polyethylene and polypropylene plastic storage tanks for liquid use, storage and transport. 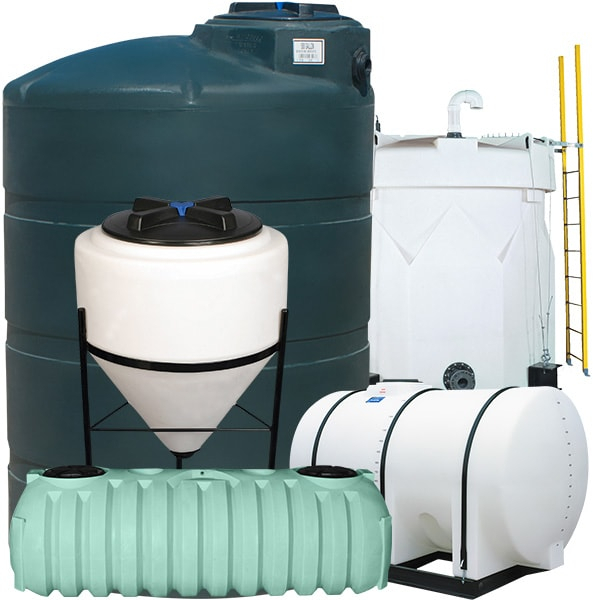 These plastic tanks are used in a variety of residential, commercial, and industrial applications. They are used for water, rainwater, agricultural chemicals, industrial chemicals, and oils. Agricultural chemical examples include fertilizers and pesticides. Industrial chemical examples include sodium hypochlorite (bleach), sodium hydroxide, sulfuric acid, calcium chloride, ferric chloride, ferrous chloride, phosphoric acid, hydrochloric acid, and diesel exhaust fluid. Many of Protank’s plastic tanks can be custom built per specifications. Options such as fittings, gaskets, valves, and manways are customizable. Three to five year manufacturer warranties are available for most Protank’s plastic tanks. Contact us about custom plastic tank fabrication options, material compatibility, or for more information on plastic storage tanks.